What if I told you that nothing says I love you quite like this Kale, Pecan & Cranberry Pasta Salad? According to warm responses after tasting just one bite – it’s true! This salad “speaks” love. It’s basically like serving a smile or comfy cozy hug in a bowl. And I don’t know about you, but I’m crazy about making people smile by sharing fantastic food! Kale, Pecan & Cranberry Pasta Salad is tangy, sweet, hearty, savory, nutty, crunchy, and chewy! It’s everything you want in a dish! While you may think I’m getting a little goofy with the love talk, I kid you not. Even when I just look at this gorgeous bowl of deep luscious greens, love is what I feel. It’s a deep, pure, palatable (heh heh heh) love for this fabulously delicious, satisfying and downright crave-able Kale, Pecan & Cranberry Pasta Salad. Furthermore, there is a point in this recipe where you roll up your sleeves and lovingly rub the dressing into the kale with appropriately scrubbed bare hands. Sounds weird to be loving on the kale, I know. But gently massaging the leaves makes all the difference in the world when it comes to creating tender kale. And the aroma that fills your kitchen while preparing this salad is nothing short of intoxicating! This salad has such a natural draw that when I get to the massaging step in the recipe, family members magically appear in the kitchen! Or maybe it’s the delicious scent of plump pecans toasting on the stove. Anyhow, with hope-filled eyes, they enter the kitchen and joyfully proclaim, “Mmm… you’re making your Kale, Pecan & Cranberry Pasta Salad!” I smile, nod my head assuredly and quietly do an internal happy dance. I delight in knowing that I am giving my family something they enjoy as well as something completely nourishing. Have I mentioned that Kale, Pecan & Cranberry Pasta Salad has boatloads of Vitamin A and Vitamin C? Check the nutritional contents below the recipe to see what I mean. It boasts a hefty dose of fiber and protein, too. Additionally, the sodium content is next to nothing, and that’s simply terrific when you’re watching your blood pressure. Yes, I agree – this tasty salad rocks! 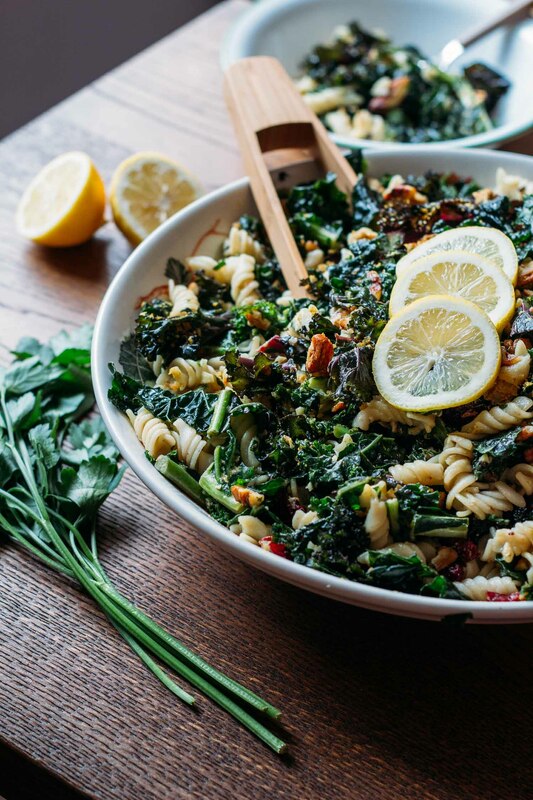 And whatever you do, don’t rob yourself the pleasure of getting lost in a bowl of this fresh, life-affirming, lip-smacking, Kale Pecan & Cranberry Pasta Salad! Kale, Pecan & Cranberry Pasta Salad is terrific served all on its own, just a big bowl and a fork work just fine. 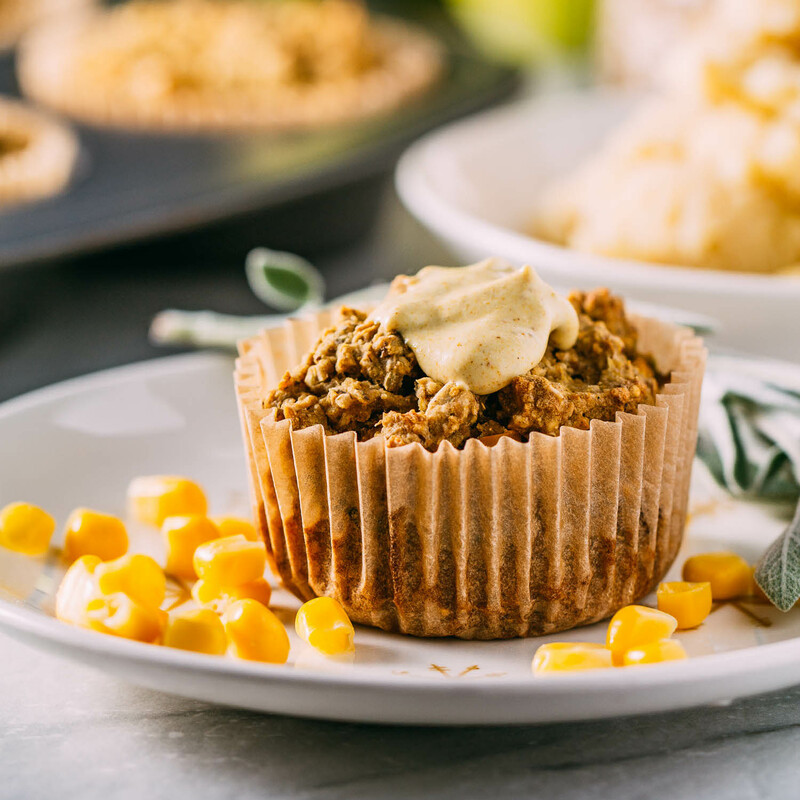 But if you ever want to impress the socks off of family or friends, I suggest making a batch of our equally tasty Gluten-Free Cornbread Muffins to accompany this delightfully pleasing salad. 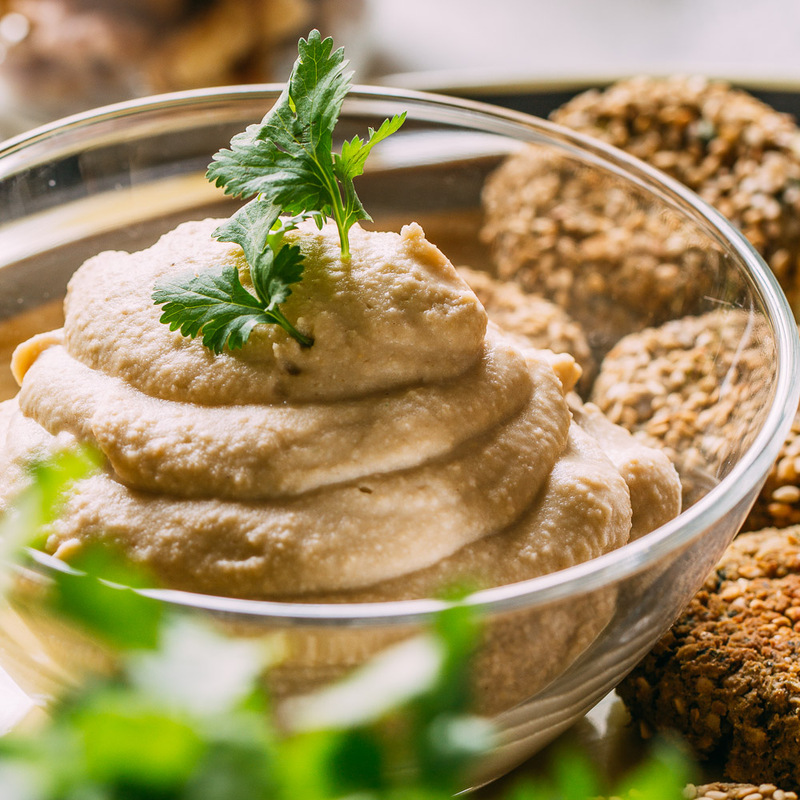 In fact, if you have an occasion where you need to bring a dish to share with a crowd of diverse diners, bring these two favorites and watch the jaws drop in awe when the flavor hits their tongue! Nothing gets you invited back to a potluck quicker than when you deliver taste sensations like Kale, Pecan & Cranberry Pasta Salad & Gluten-Free Cornbread Muffins. So maybe I am crazy in love with Kale, Pecan & Cranberry Pasta Salad. After you try it, you may just fall madly in love, too! When you want to make something undeniably delicious and also want to be sure that it’s one-hundred percent nutritious, what do you do? 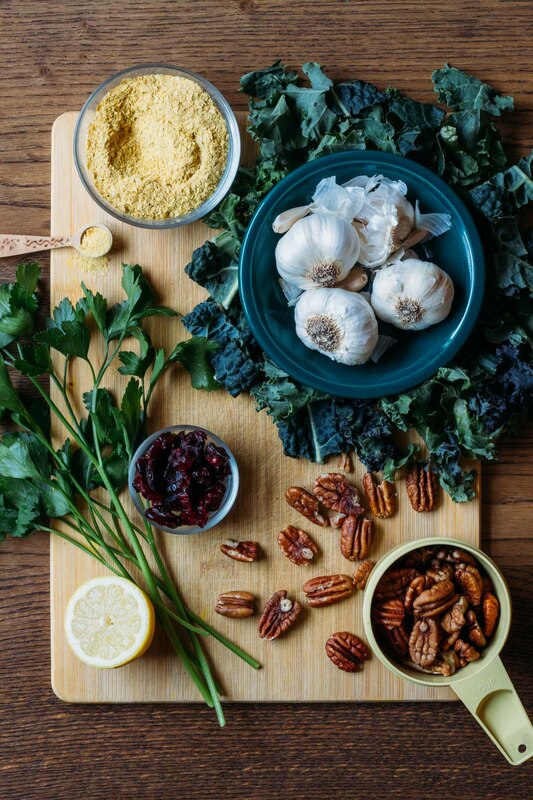 You make our Kale, Pecan & Cranberry Pasta Salad, that’s what you do! 1 - 16 oz bag of pre-washed kale or 1 lb of kale leaves - In this photo, we used organic rainbow kale. We love the look of the mixed dark greens. 16 oz of rice pasta - Tinkyada brand is our favorite gluten-free rice pasta though any pasta that fits your needs will work correctly in this recipe. 1//3 cup of olive oil - Be sure to see our notes for making this refined oil-free using veggie broth, plant-based milk or avocado, which is what we use now! 3/4 cup of dried cranberries, golden raisins or another dried fruit - We like this brand. Begin by preparing the pasta according to package instructions. After cooking, rinse it in cold water, give it a gentle shake and set it aside to drain thoroughly. Next, empty the entire bag of pre-washed kale into an extra large mixing bowl. If you are using individual kale leaves rather than a bag of pre-prepped kale, wash, dry and trim the kale into bite-size pieces before adding it to your mixing bowl. Now, in a small mixing bowl or lidded jar, combine the lemon juice, olive oil (or substitute of choice for oil-free), minced garlic, sea salt and freshly ground black pepper. Stir or shake and taste, adjusting the seasonings to your liking. Next, pour the dressing over the kale and then massage into the greens using your hands to rub the kale to coat each leaf. After the kale has relaxed, add the chopped parsley and cranberries, gently stirring to combine. Remember, this dressing is intended to complement the rice pasta and the deep green earthy flavor of kale. 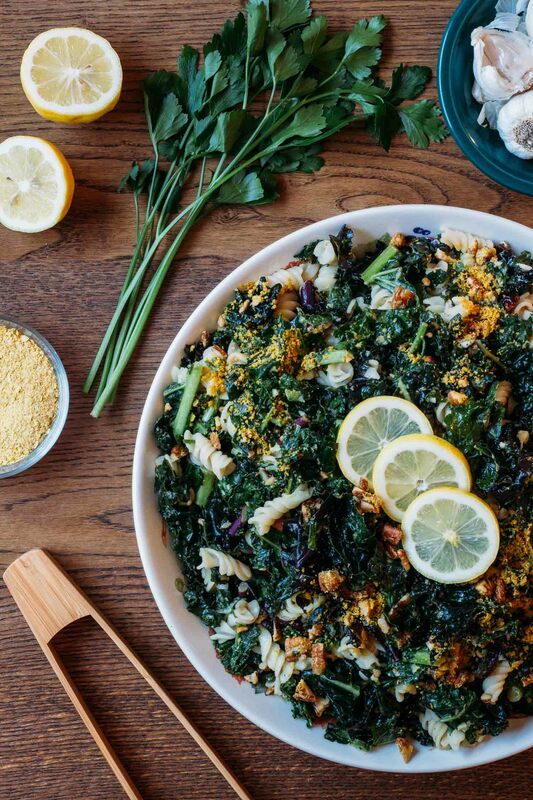 I say this to let you in on why I use so much garlic and lemon juice in this dressing; it's because the earthiness of the kale can handle it and with it, it tastes divine. Sometimes when testing the dressing seasoning, I go so far as to dip a leaf of kale in it to sample how well it's coming together. Next, in a dry skillet over medium-high heat, pan toast the pecans until the aroma of the pecans begins to release. Stir continually to monitor the progress and avoid burning. Once the pecans are toasted, place them on a cutting board and give them a rough chop. 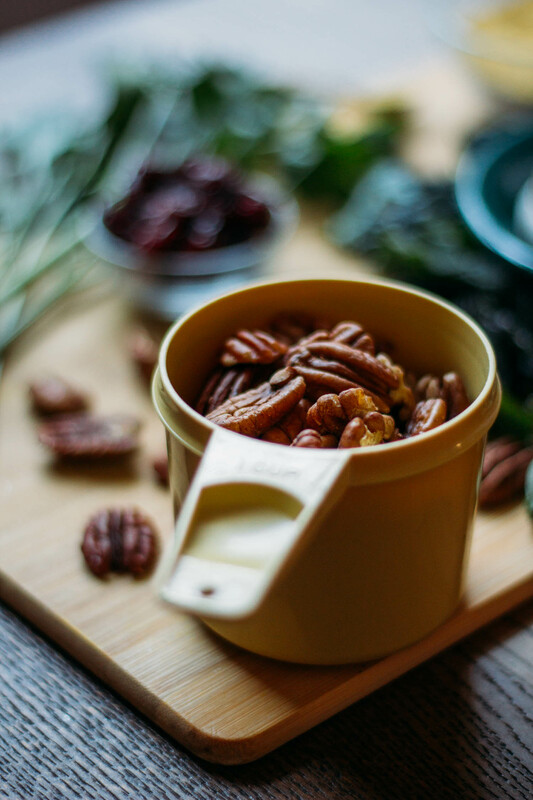 Now add the toasted and chopped pecans to your empty small mixing bowl stirring to combine with the nutritional yeast and a dash of sea salt. Once it's mixed, sprinkle the crumbled pecan mixture over the dressed kale tossing to distribute evenly. Finally, gently add in the drained pasta a little at a time until everything is thoroughly combined. 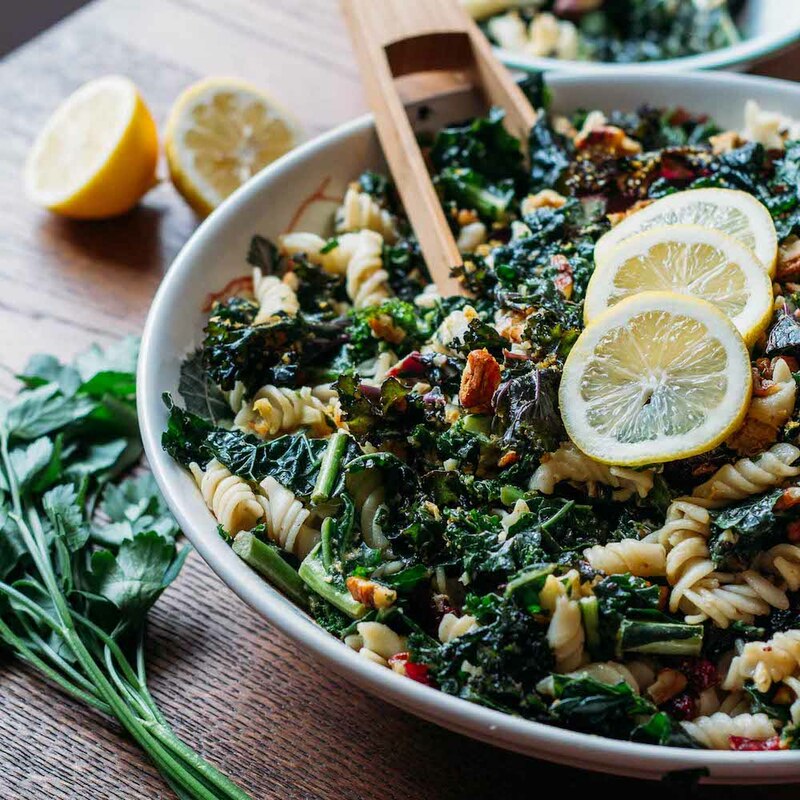 Enjoy your gorgeous Kale, Pecan & Cranberry Pasta Salad immediately or store covered in the fridge until ready to serve. This salad stores and travels exceptionally well and will keep for quite a few days providing that the kale is nice and fresh. While our beloved Kale, Pecan & Cranberry Pasta Salad recipe calls for olive oil, I encourage you to use whichever oil, or better still, no oil at all, as you prefer. To make this refined oil-free but still, a little creamy, try using a dash of any unsweetened plant-based milk lite or regular coconut milk instead of olive oil. An even lighter and healthier suggestion is to use a well-seasoned vegetable broth in place of the olive oil. One final idea would be to switch out the oil for a naturally creamy avocado. 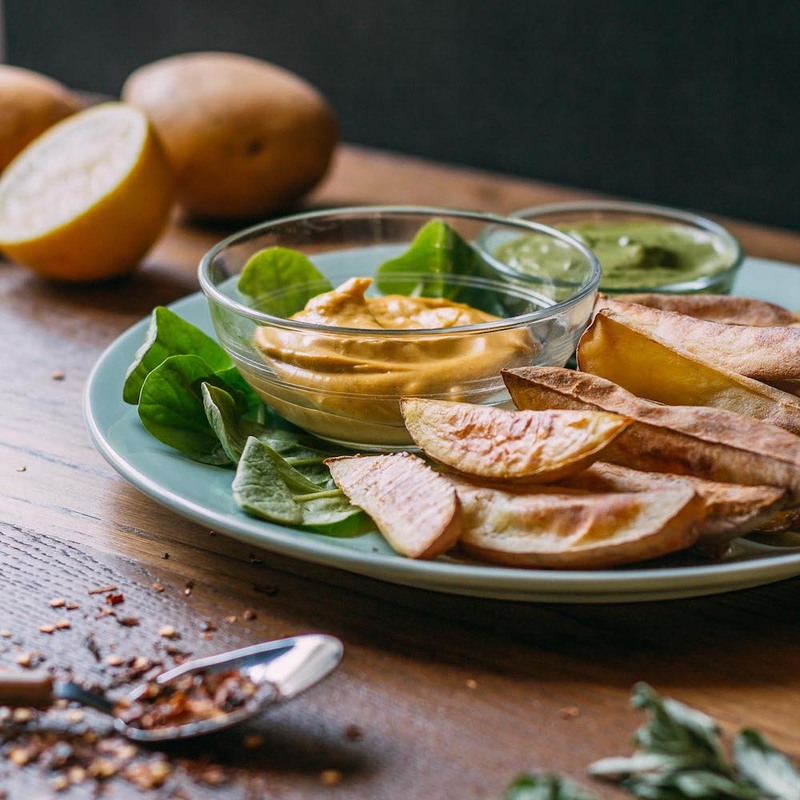 All of these oil-free alternatives create a lovely outcome; the lemon and garlic in the dressing are what makes this dish the star of the show no matter which alternative you prefer. The nutritional information shared below reflect the inclusion of olive oil as that is what I used back when I created this recipe. Should you prefer to make this refined oil-free, the numbers will come in even better, fewer calories and way less fat, etc. Sunflower or pumpkin seeds can be used as a substitution for the pecans if you happen to need this recipe to be nut-free.